I thought it would be helpful to break down bird blogs into a couple of categories to see what is happening in different sectors of the bird blogosphere. The aforementioned ABA Blog tops the list in this category because of great content and because the ABA was smart enough to hire a bird blogger, Nate Swick (who 10,000 Birds readers will, of course, recognize), to run the blog. Cornell’s Round Robin is visually compelling but light on content. (Their last post was 21 December.) You can tell when they hit their mailing list with a link to their blog, however, because their traffic goes through the roof. Audubon Magazine’s blog, The Perch, while more of a consevation blog than a birding blog, gets very nice traffic. Though the ABA has a smaller base to work from their blog gets the most traffic of the three, probably due to their excellent use of social media and their willingness to use their blog as a place to make major announcements about the organzation. It’s nice to see them thriving and it makes me, as a blogger without an institution backing him up, worried should one of the big organizations get their online act together. Though there is still a constant stream of new bird bloggers getting into the bird blogging game the age of the individual running a well-read bird blog is essentially over. In terms of traffic, the only blogs on the Nature Blog Network top ten in the bird category are Lee’s Birdwatching Adventures Plus, The Zen Birdfeeder and Birdchick. The first is really more about Christianity than it is about birding, The Zen Birdfeeder is a labor of love for Nancy Castillo and she does a great job engaging her audience and her customers as a bird-feeding store owener, and Sharon Stiteler’s blog, while wonderful and with a unique voice, has seen a decline in traffic as she focuses on other projects. It is nearly impossible for an individual to keep up with the amount of content a group can generate and a single voice gets lonely compared to the chorus that a group can provide. Even “celebrity” bird bloggers like Julie Zickefoose and Bill Thompson have had traffic slow down. Again, this isn’t to downplay the quality of the content being put out by bird bloggers blogging alone but to highlight the challenge of keeping a blog going year after year after year by yourself. It is amazing that it can be kept up at all, and also amazing how much good content can be found in the many blogs getting between thirty and two hundred visitors a day. The one aspect of individual blogging that seems to work really well is the big year blog. The limited time frame, the built in story lines, and the intense focus on a single goal make them very compelling. Last year featured several really good big year blogs come out and it looks like this year has another fine crop. Perhaps some birders should pitch in together and decide ahead of time to do a big year blog together in 2014? That would be a blog to be reckoned with! The return of I and the Bird is exciting (though I may be biased) and a great way for a new bird blogger to get some links and maybe some recognition. We bird bloggers need to help promote each other and drive traffic to each other’s sites. A rising readership lifts all blogs after all. Bird blogging is here to stay though it will always be changing. What do you think the next big thing in bird blogs will be? And should we start a yearly Bird Blog Awards in order to help spread the word about the great content that is out there? It is fascinating to track the trends in bird blogging. I think we hit a point of saturation with personal bird blogging. I used to read every single blog listed in my blog roll “The Big Birding Blog List”, but I just can’t keep up with all of them anymore. I read every post from every BirdingIsFun contributor on their own blogs. In addition to them, I only have a handful of other blogs that I frequent daily. The multi-author and institutional blogs generally offer a great venue with quality posts than in and of themselves steal away my time. BirdingIsFun.com has had two record breaking months of traffic in a row and is on track for a third right now. I still don’t comprehend the metrics fully and there are certainly ways to increase traffic that I haven’t realized yet. Greg Neiss and Nate Swick are doing amazing things at the ABA. I understand why their personal blogs are being sacrificed upon the alter of the ABA. They deserve a lot of credit for helping restore the ABA to relevancy. I’m tempted to plunder a couple of the great writers and photographers from BirdingBlogs, but dang that Gunnar. In his own strange way he has endeared himself to me and I don’t want to start a birding blog war. That is the curious and wonderful thing about the birding blogosphere…we are almost all friends and extremely supportive of each other, promoting and sharing each other’s work regularly. It’s been an interesting ride and we’ll see where it goes into the future. A birding blog war you say? I would certainly read about that! I hereby declare open season on Gunnar’s BirdingBlogs.com! Watch for a throw down in tomorrow’s Google + hangout. As Robert suggests, I definitely think it’s a rising tide lifts all boats scenario. If one blog is doing really well, that opens up opportunities for other blogs, particularly with regard to Google search optimization. I know I generally see the ABA Blog (and to a lesser extent, my own) having good days when other blogs are doing so as well. I think it goes back to why people write online. Many were just interested in sharing photos and short stories with friends, and once Facebook came along that was a more efficient way to do that. That did, however, leave room for the multi-author blogs with a bit more clout to come in and offer those people who still wanted to write, opportunities to do so for a larger audience but with less pressure to publish. I see us as having just as many voices, but in not as many places, which isn’t necessarily a bad thing. Cool, I’m in the top 40 again! Thanks for including us (Round Robin) in this roundup! Nate’s point about Facebook superseding the needs of some bloggers is right on track. The “daily diversion” aspect of a blog can now be done on Facebook and is a great way to feature existing articles, videos, Macaulay Library sounds, species accounts, etc., without diverting people to a separate page (i.e., a blog) first. I wonder how other bloggers feel Facebook is either helping or hurting their cause? Hugh, I was a late started in embracing Facebook as a venue to interact with my readers, but since I have my web traffic has jumped significantly. I’ve tried to keep my blog as the central hub with all social networking as the spokes connecting to people and bringing them back to the blog. As an independent birder, I pretty much have to in order to establish a brand and reader loyalty. I suppose my blog is my institution. Where you represent a well-known and very loved institution in the birding world, I’m confident your goals and purpose for existing are different than many bloggers. Your blog doesn’t need to be the entree, just a really nice side dish. Thinking about the ABA, I’m of the opinion that the ABA Blog has become the flagship of that institution. The ABA also has a very vibrant Facebook community wherein the public interacts regularly on a personal level with ABA staff and even the ABA president. While a large percentage of ABA members never visit ABA websites, more and more of their print publications are directing folks to their internet presence for supplemental content. I’ve noticed many independent bird bloggers have abandoned their blogs and enjoy fulfilling their passion for sharing within the context of Facebook, Google +, and to a lesser extent Twitter. This internet environment is changing so rapidly, it’ll be fun to watch it evolve. I hope I can stay on the leading edge of it. I think I can safely speak for some of us so very much lesser lights when I say that my blog isn’t about those reading it as much as it’s about the one writing it. Now I’m not saying I would exactly m i n d having an audience as large as (but different from) that of 10kB, but I think I’m reaching the handful of people who care about the things I care about, and writing a little bit several times a week is a good writerly discipline for me and a great way to keep from doing my real work. Rick, you know you can have it all… come on back to the fold! Robert’s position on social media mirrors our own here. The blog is the central location, which our Facebook presence both mirrors and extends. I think that, of all the different social media platforms, Facebook has been the most effective and enjoyable to use for that purpose. Don’t count us out just yet on Birdingblogs. Our posting frequency have just diminished, but we still get a lot of traffic on daily basis in spite of not posting much. I was travelling a lot last year myself , and did not have that much time to keep up my own posttings. A series of commttments from the others at the same time. Tom became a father, for instance. Reloading with the second round of World Birding DestinationCuo right now. And additionally I am very excited over the Birding 101 blog which has been my main blogging focus lately. But it is also true, that a lot of the bloggers content themselves sharing on FB: In truth, the formats compliment each other. 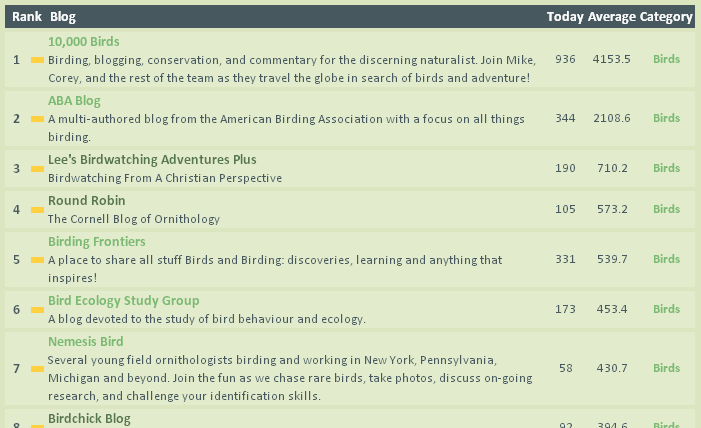 There will be more and more birders who blog. Because it still is the best way to share you bird photography to a larger public if you have a set you want show, and to tell a story about it. It gives alll those thousands or even milliions of new digibirders a space of their own. Bird blogging can only grow if you ask me. I’m for one am very happy I and the Bird returns in a new more interesting format. Too bad I missed the Cormorant issue. I could have suplplied a picture and link to Red-legged and Guanay Cormorants. Yeah, North American Birding is, shall we say, in stasis. Or how about torpid? I had a bunch of essays in my head … mostly about being a kid birder in the 70s that I needed to build a home for, and I found a bunch of really cool people who wanted to party with me. But now the party seems to have s l o w e d.
…but yeah. My duties at the ABA have consumed me. And I’m having a blast. Corey, I have tried to join the Nature Blog Network a couple of weeks ago but have not received any response from you. I am still waiting for approval and the html code, so I can place this on my blog. Please advise if there is a problem and whether I have done something wrong. It would be great to have my blog included on your TopList! @Ken: I have nothing to do with the Nature Blog Network. That’s Mike’s gig. Why don’t you drop him an email? This is an interesting conversation on bird blogging, guys. I’m grateful to hear the perspectives of so many excellent bloggers as I watch the development of social media as one of the venues I use within the marketing strategy for my Birder Murder Mysteries. I’ve often benefited from getting a mention on your blogs, and I try to return the favor – in fact, in the newest ebook versions of my mysteries, we’re now including links to a variety of online birding resources and blog lists. I figure whatever we can do to raise up new birders, the more we all – birds and birders – benefit. Always a late bloomer. I have just begun blogging, mostly about birds. I have spent more time outside than in this virtual reality and have only just found all these amazing blogs. Just this morning I discovered Nature Blog Network and this here 10,000 Birds tonight. Sigh. Better late than never I suppose. Luckily I am not looking for traffic, simply a place to express. All of you have inspired me greatly. Thanks.